One of the fundamental properties of a minor planet is its rotation rate, usually expressed in hours. The periods of more than 8300 minor planets are now known. They are plotted as frequency (cycles/day) vs. size (km) in the figure below. From the results used to create this figure, it is possible to draw several important conclusions for rotational statistics. Most minor planets have rotation periods that are greater than about 2.2 hours with the majority being between 4 and 10 hours. Objects spinning faster than about 2.2 hours must be "strength-bound" (e.g., monolithic), otherwise they would fly apart. Most smaller objects spinning slower than 2.2 hours are likely "rubble piles", loose conglomerations held together by mutual gravitation. There is an excess of slow rotators among smaller minor planets. The rotation rates were determined mostly by the analysis of lightcurves, which are plots of magnitude versus time. Mathematical (e.g., Fourier) analysis of those data points leads to the determination of the period. It can also show that a minor planet is binary or in non-principal axis rotation ("tumbling"). In some cases, a carefule review of the rotation period for a given minor planet over the years can show that the minor planet's period is changing, getting slower or faster over time. The formation of binary minor planets, tumbling action, and period change are most likely due to the YORP effect, which is a thermal process where absorbed sunlight, re-radiated as heat, can affect the minor planet's rotation period and even spin axis orientation. Another effect, the Yarkovsky (the "Y" in YORP), can cause the minor planet's semi-major axis to increase or decrease. 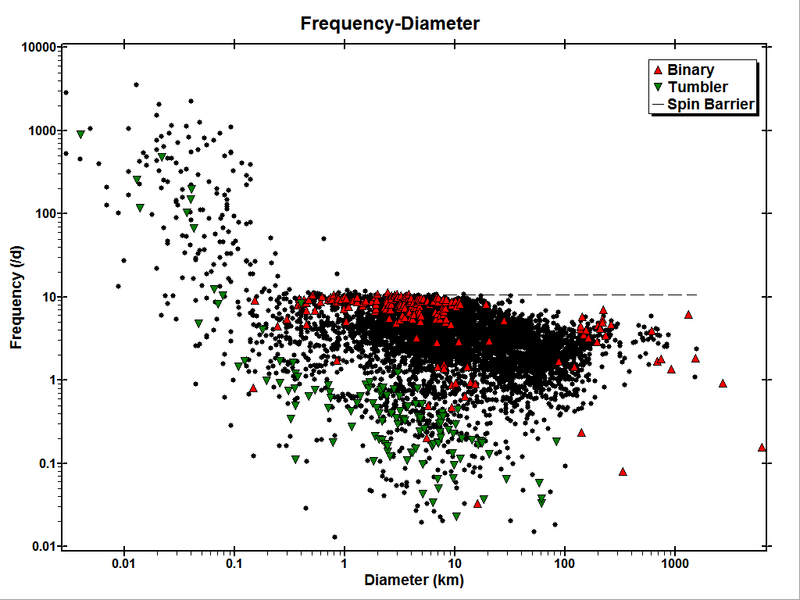 The shape and spin axis orientation of a minor planet can be determined if a sufficient number of lightcurve data are available. For main-belt objects, data from many years, even decades, may be required to get an accurate picture, assuming supplementary data from radar, adaptive optics, and/or occultations are not available. The minor planet Lightcurve Database (LCDB, Warner et al., 2009, Icarus 202, 134-146) is a repository for minor planet rotation rates and other basic information such as size, albedo, absolute magnitude (H), etc. However, for modeling of shapes and spin axis, and for further development of theories regarding binary formation, tumbling, and the role of the YORP effect, researchers need full access to the complete lightcurve data sets, not just the results of the analysis. The purpose of this site is to allow researchers to upload their observations to a central repository and so make them available for others to use in independent study. As with astrometry data, a standardized format has been adopted so that supplying and using the data require_onces a minimum of effort. The ALCDEF (Asteroid Lightcurve Data Exchange Format) standard follows a "FITS-like" style, using a header with <keyword>=<value> pairs to describe the data and a separate data section with DATA=<data> lines. The full definition is outlined here.